A group of deaf young people created a short animated film which has gone on to be a big hit at festivals. The Rocknose Project - we helped a Cornish community develop their media skills. 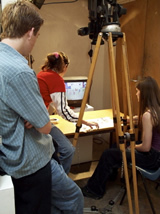 Workshops introduced local people to digital image editing and desktop video. Mix in the Sticks - an ambitious project for First Light. A group of young people in a small Somerset town learnt video animation, DV filming and editing skills allowing them to create an excellent piece of video art. Lives and Landscapes - we produced 9 video pieces celebrating contemporary Dartmoor for Aune Head Arts. Image left is from Blue Kayak, based on filming on the River Dart by Jeremy Van Riemsdyke. Photographic panorama on Plymouth Hoe - 1st January 2000. Part of the worldwide "Wrinkle in Time" project. Logo design and corporate identity by Kayla Parker of Sundog Media for Skillnet S.W. - The Media Training Consortium for the South West. One of a series of photographs for Chacewater Yacht Company . Full-page national magazine advertising campaign, shot on 6x7 format from a Jetranger helicopter. Frame from "Deepend" video projection, part of a live performance at the Arnolfini, Bristol. Lighting and underwater camerawork by Stuart Moore of Sundog Media.